Model size: cloisonne: 2.75" x 2.75", Byzantine: 3" x 3"
Description: The leaflet features 12 ornaments: six are cloisonne-style renderings of fruit, and six are geometric patterns inspired by Byzantine art. The fruits include: apples, peaches, pears, cherries, plums and grapes; these are stitched over-one. 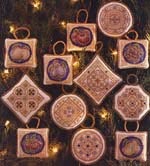 The Byzantine ornaments are stitched in shades of gold and jewel tones accented with specialty stitches and gold beads. Background Information: These pieces were designed to be conciously different from "traditional" ornaments. The size constraints proved to be quite a challenge, and there was also the necessity of creating a series of at least six designs for each "style" of ornament. I have long admired cloisonne with it's beautifully vivid enamels and graceful gold outlines; the only way I could begin to capture the intricacy of this art form was to design this series to be stitched over-one. The almost abstract, highly stylized gold forms and inlaid gems common to ecclesiastical Byzantine art also fascinate and inspire; choosing the colors that most accurately represent gemstones is a challenge indeed! Stitching Comments: Since they are designed totally in whole stitches, the cloisonne fruits, although time-consuming, are relatively easy to stitch. (no blended floss colors and no backstitching either!) The Byzantine ornaments are like small studies in specialty stitches (mostly eyelets and satin stitch variations). I sometimes reccommend one of these designs for those just learning specialty stitches, or if a smaller project is desired. Each series of six could also be stitched together in bellpull format.